Set a rack inside a large heavy roasting pan. Mash 1/2 cup butter, sage, lemon zest, and paprika in a bowl to combine. 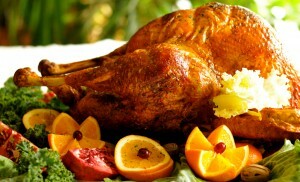 Starting at neck end of turkey, loosen the skin of the breast by gently sliding your fingers underneath. Work half of lemon-sage butter under skin. Loosen skin around legs and thighs; work remaining lemon-sage butter under skin. Season turkey inside and out with salt and pepper and stuff with lemons. Transfer turkey, breast side down, to prepared pan and refrigerate, uncovered, overnight. Let turkey stand at room temperature for 1 hour. Preheat oven to 375°. Pour hot water into pan to a depth of 1/4-inch. Roast turkey, basting occasionally with remaining 1/4 cup butter, for 1 hour. Using paper towels, flip turkey; roast, basting occasionally, until an instant-read thermometer inserted into the thickest part of the thigh registers 165°, 1-1 1/2 hours longer. Transfer to a platter. Let rest for at least 20 minutes before carving. Copyright © Peggy Lampman's dinnerFeed.